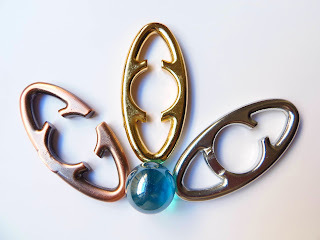 Oskar van Deventer, yet another prolific puzzle inventor who contributes with many of his designs for the Hanayama Cast Series (11 so far), has outdone himself, again, with the Cast Nutcase, which may as well drive you nuts if you attempt to solve it. 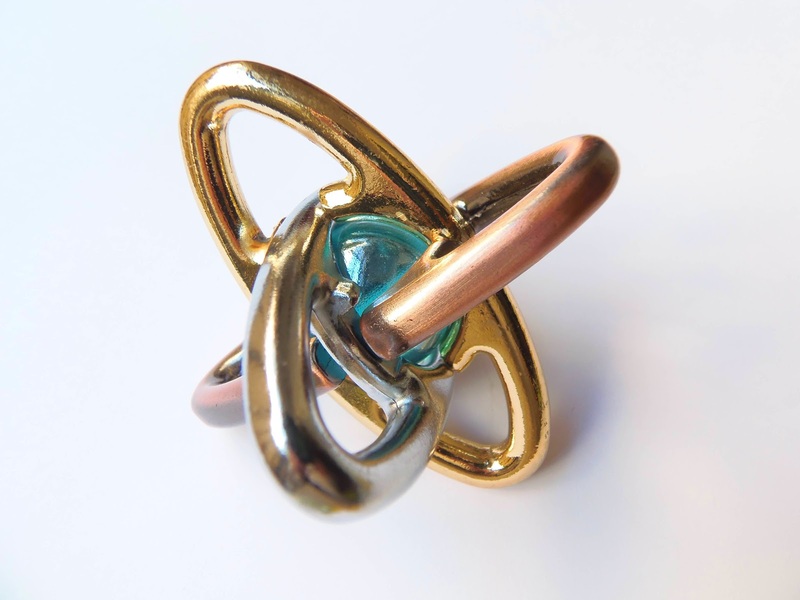 The Nutcase was released by Hanayama in November 2006 and the key word is "interlocking". The puzzle itself is very different from any of the others in the Cast family. The design doesn't stand out much and its object is anything but straightforward, which might take some time to even begin to understand what you're supposed to do with it. Yes, the puzzle does comes with an explanation, but only tells you what you're supposed to accomplish with it, not a single clue as to how to get there. In fact, the Nutcase has two goals: the first is to remove a small nut that moves freely inside it; the second goal needs you to swap the engraved nuts "Nut" and "Case" over as to read Casenut instead of Nutcase. I believe both can be accomplished at the same time, but I can't confirm that, as I didn't solve it yet. The Nutcase is one of the toughest Cast Puzzles I've encountered so far, right on par with the Vortex, and I own all of them. 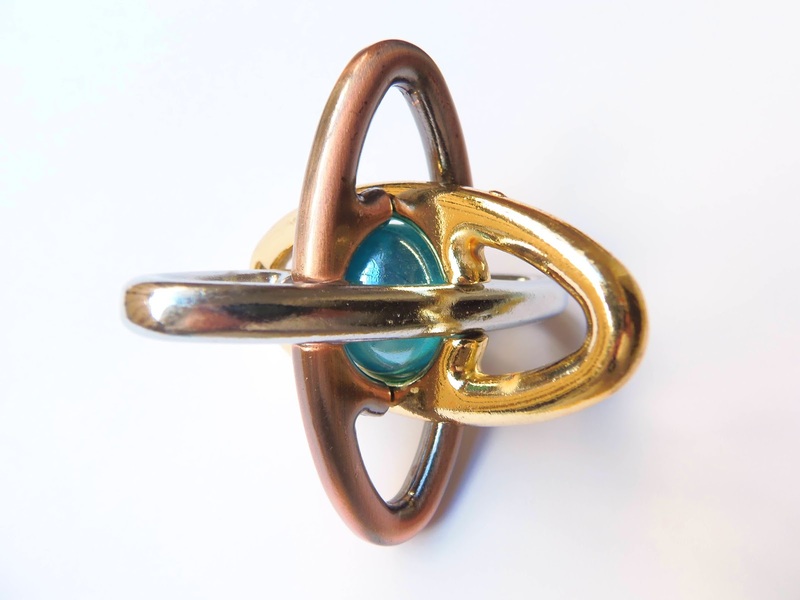 It's rated by Hanayama with the highest difficulty level 6/6, and in my opinion these two should have a special rating of their own, as an exclusive level 7. I got the Nutcase back in April this year, together with a lot of other puzzles from Sloyd, and since then I've tried on and off to solve it. The result, as expected, is always the same. I end up getting frustrated and leave it for another few weeks to try again. After eight months of constant disappointment, I'm ready to admit defeat on this one. I just can't figure this one out. 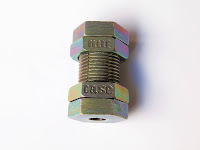 The outer nuts can be screwed on and off freely up and down the bolt, but there's no apparent visible change with the movements. The bolt is actually two bolts that should come apart, but the only thing you notice is a slight movement of less than a millimeter when you try to pull them apart. There's a small hole on both sides that allows you to see a small nut move inside, but again there's no clue of what its purpose is in the actual solution. I guess this one has to stay unsolved for quite a long time, until I gather enough courage to pick it up again. If you really like those close to impossible challenges, the Cast Nutcase is the right choice for you. Whether you're a veteran puzzler or not, be prepared, as this puzzle might be the toughest nut to crack yet. Availability: You can get the Cast Nutcase at Sloyd, in Finland. You can also find there all the others in the Cast Series. A few weeks ago I posted about the Trick Bolt #2, which is the second of two Trick Bolts I got from PuzzleMaster. At the time, I tried to solve both puzzles, but only got so far with #2, as #1 proved to be much trickier than I was expecting. Both puzzles are produced by PuzzleMaster and, curiously enough, both of them are rated with the same level of difficulty, level 7/10. To me, this doesn't reflect the real level of challenge that one puzzle has over the other, being #1 much harder than #2. 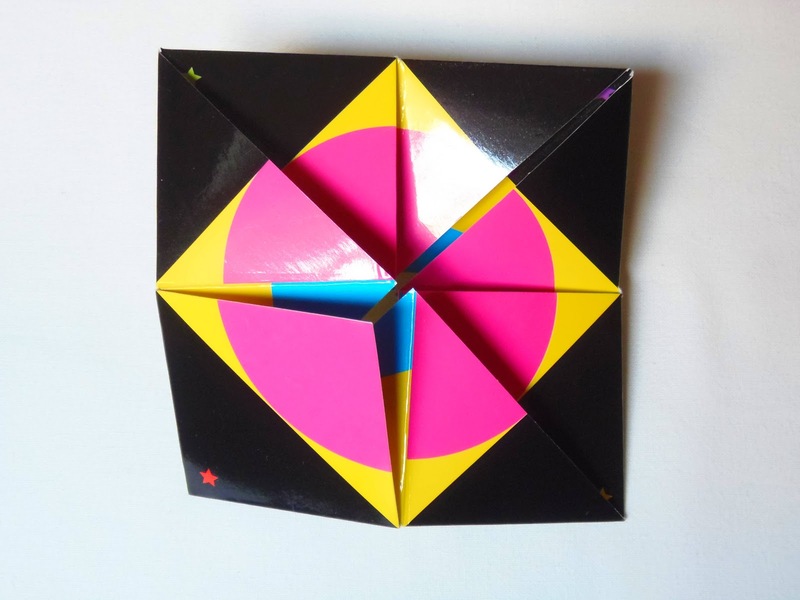 The object of these puzzles is more or less the same as well, with both rings having to be removed. The path to get this done, however, is anything but similar. I managed to solve the Trick Bolt #2 within a few seconds after picking it up, whereas the Trick Bolt #1 was solved after well over one hour after picking it up (cumulative time, as it took more than one session) - Draw your only conclusions... Do they really look like a similar challenge? - At first they do, but after a few moments your perception is completely changed. I reckon the better level rating would be level 5 for #2 and level 8 for #1. 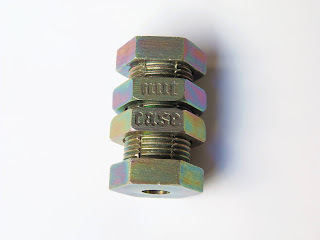 What confused me more about Bolt #1 was the fact that the nut wasn't welded to the bolt like the #2. This clearly indicated that the solution revolved around this area. 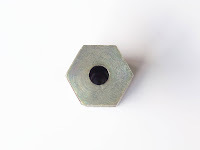 Nevertheless, no matter how I tried, the nut only moved like a millimeter in both directions. What I was able to do so far was getting the nut screwed on even farther, not off. After a lot of frustration and both hands and fingers a bit sore, I discovered the solution almost by accident. When holding the bolt with one hand and trying to unscrew the nut with the other, I realized that the nut was screwed off a little, which was something I hadn't managed to do until then. 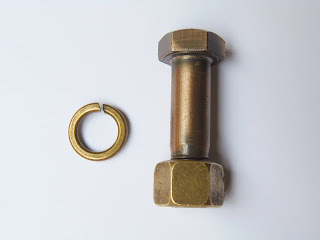 I tried the same movement again and, to my surprise, the nut was finally off the bolt and the ring was freed. Solution: If you're ready to give up, look no further. Download here the solution. After removing the nut and seeing how the mechanism worked, I can only tell that the concept is quite genius. The solution is totally counterintuitive, and I was lucky enough to have stumbled upon it while I was almost ready to give up. If you're thinking on getting both Trick Bolts, prepare to spend much more time with #1 than #2. Either way, I highly recommend both puzzles. 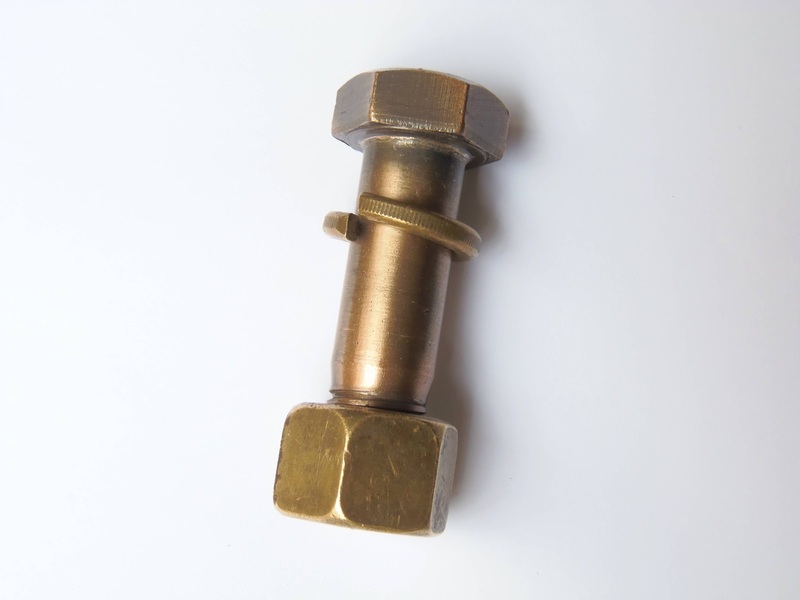 Availability: The Trick Bolt #1 as well as Trick Bolt #2 can be bought at PuzzleMaster for just $10 USD each. Nob Yoshigahara might be best known for his ever popular classic game, Rush Hour. However, thanks to his genius, he left us many other great puzzle inventions such as the Hoppers, a fun and addictive solitaire game manufactured by ThinkFun. 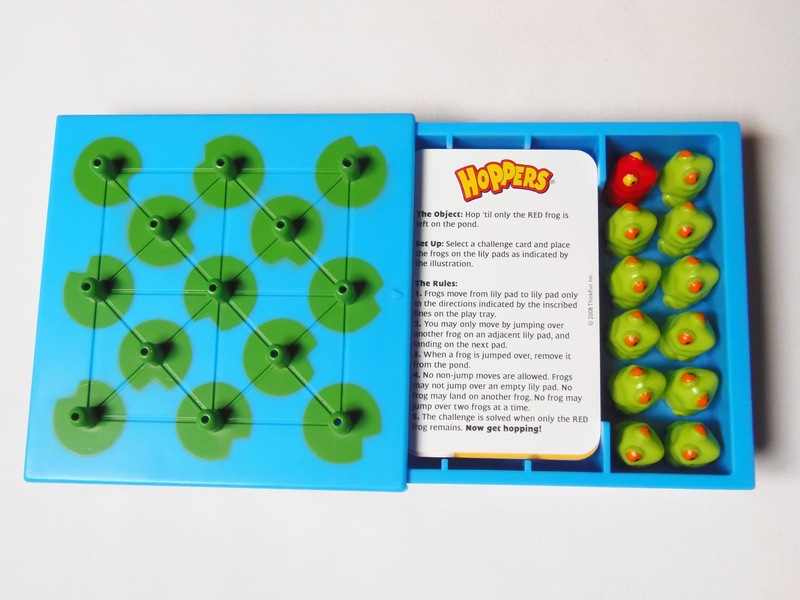 Hoppers was first introduced in 1999, when ThinkFun was still known as Binary Arts - A much cooler name in my opinion. At the time, the version that was released didn't feature the red frog, like the one you see here, which wasn't introduced until early 2003. A year later, Binary Arts decided to launch a slightly different version of the game with business executive tokens called Downsize. This version is no longer in production and might be rare to find, but I was lucky enough to find one for my collection on eBay a few years ago. I did get the Downsize version first, but now I much prefer the Hoppers game, as I reckon the idea of the frogs jumping over each other works better. 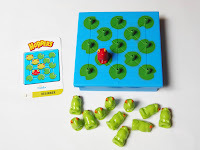 Hoppers is quite simple to understand: You pick one of the 40 challenge cards and set up the board with the frogs exactly like you see on the card. 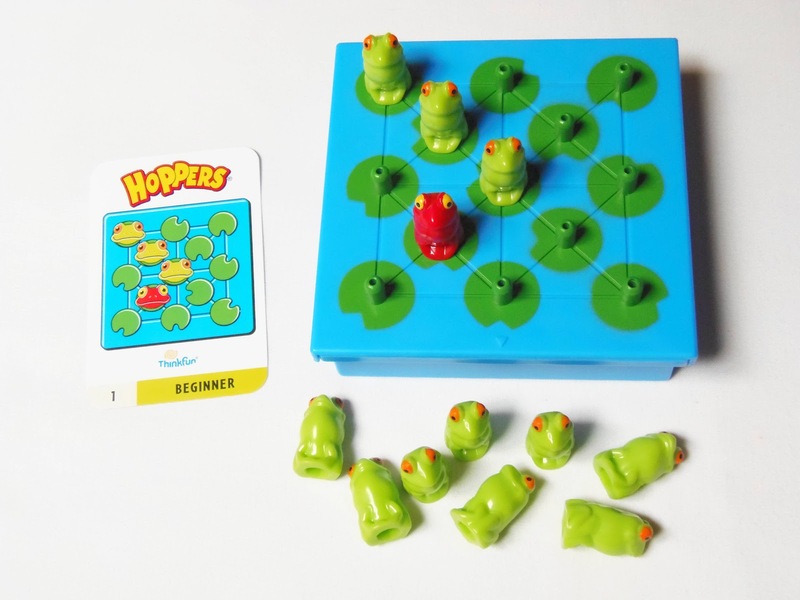 Like any other solitaire game, you solve it by taking one step at a time, removing one token simply by hopping over another into an empty space, as indicated by the lines on the board. You have the challenge solved when you're left with only one frog in the pond, the red frog. The current version of Hoppers with the red frog is believed to be harder than the older version. In this one, the red frog must survive until the end and be the last token on the board. 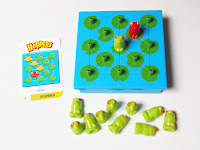 The new version also reduces the number of possible movements for each particular solution, because you can't just make a move that'll result in the red frog being removed. Something that might give some confusion is the fact of the red frog being moved altogether. 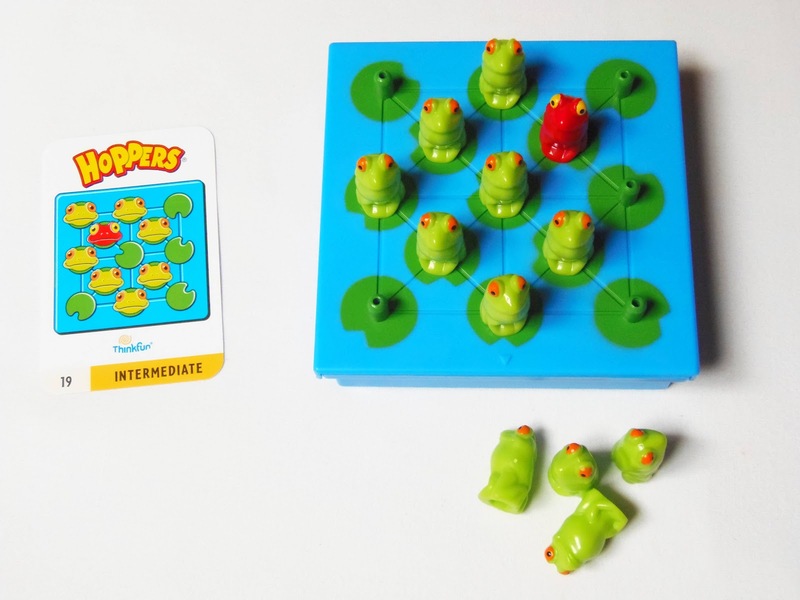 In fact, you can move the red frog over other frogs just like any other token. Just make sure the moves you do have the right sequence that'll end with the red frog as the last one on the board. 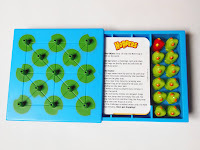 The included 40 challenges are divided into four difficulty levels (beginner, intermediate, advanced and expert), which will keep you busy for a long while. 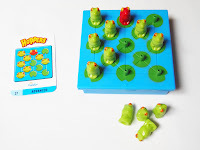 Some of the intermediate challenges already require some heavy thinking, but the advanced and expert levels will surely put your solitaire skills to the test. It took me over 10 minutes at times just to solve a single challenge. For reference, the earlier levels don't take more than a minute or two to be solved. I love solitaire games! I have several of them in my collection and they're among my favorite fun puzzles to solve. ThinkFun deserves all the credit for having a wide selection of these great puzzles in their catalog, and Hoppers is one of the best. I highly recommend it for any one remotely interested in puzzle games. Availability: You can find the Hoppers game at Sloyd.fi in Finland. Worldwide shipping available. Can you solve the next ones? 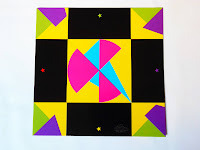 Over the last couple of months I have been reviewing some of the latest puzzles from the inventor Ivan Moscovich, manufactured by Fat Brain Toys. 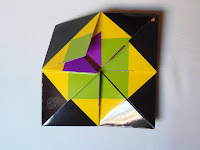 Today, I present you the last in this series of puzzles, simply called Fold, which will leave any origami wiz puzzled. 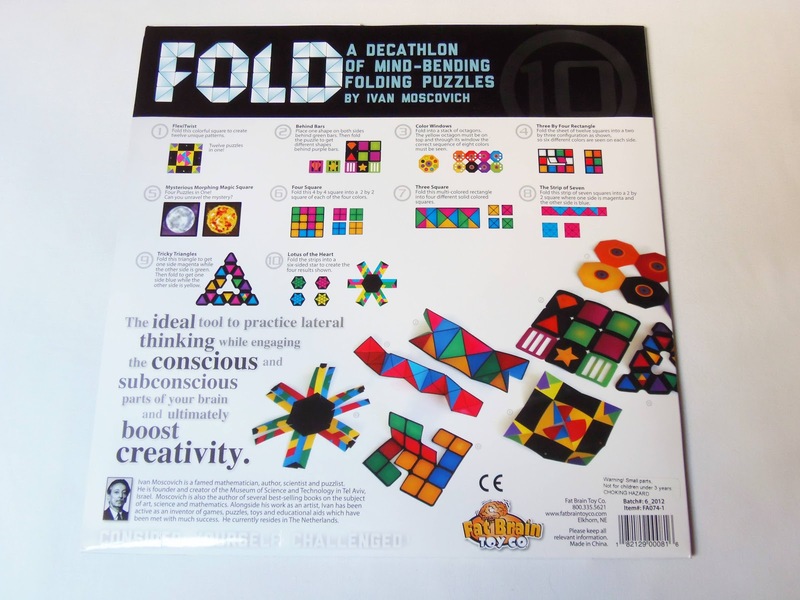 Fold, like Craniatics, is a collection of ten brainteasers in which you need to - you guessed it - fold them into various shapes to achieve the desired solution. 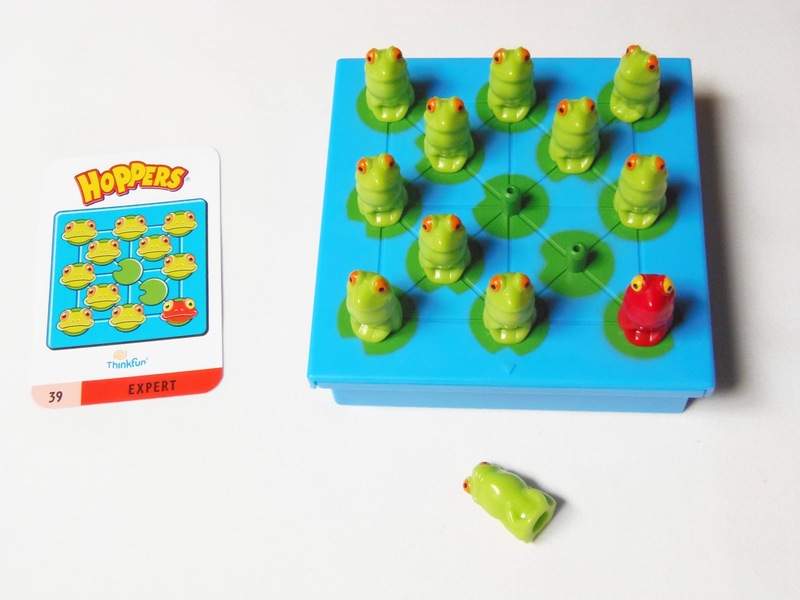 Most puzzles offer multiple challenges, so in reality you get much more than just ten brainteasers. 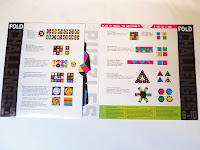 The puzzles are also conveniently stored in a folder (see photo below left), as to prevent missing pieces. 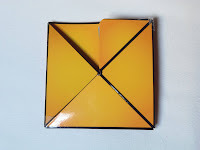 Since the puzzles are made to be constantly folded, it's safe to assume that there'll be some wear and tear after several uses. Although the folding puts a bit of strain to the material, I found it can withstand much more than you'd think. 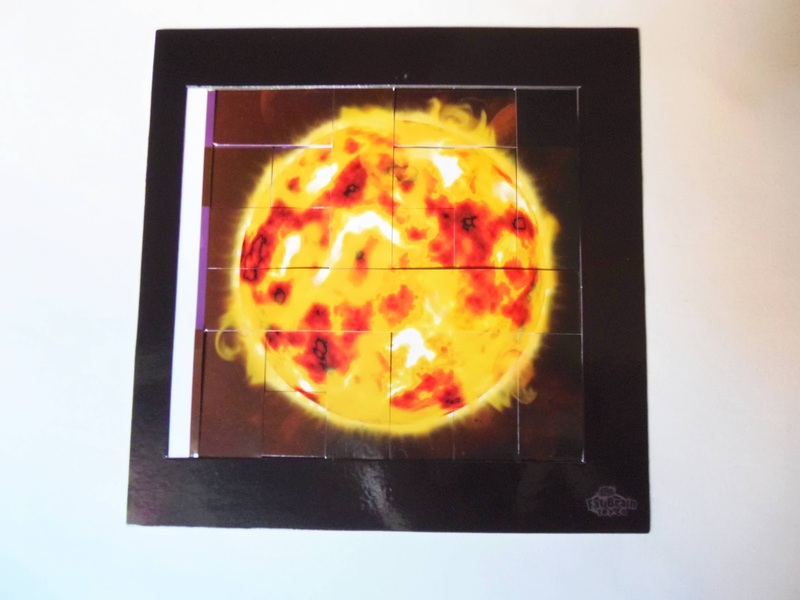 This is because the puzzles are manufactured in heavy-duty laminated paper, so no need to worry. You do have to be careful when folding a particular puzzle more than three times, though. If you feel that the puzzle might tear, don't force it and try to find a better solution. As I did for the Craniatics review, I will describe only a few of the puzzles to give you an idea of what to expect, and I leave the rest for you to discover on your own. This puzzle requites you to fold the square into 12 different shapes. 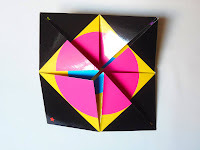 You can fold the parts into different directions and even flip them. Solving the first shape is quite hard, but as you get the hang of it, the others will come more naturally. This was one of my favorites from this collection. 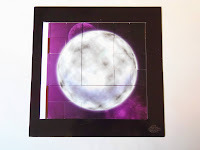 You have a frame full of horizontal and vertical strips, and your task is to weave them into one of three possible images by intertwining the strips: the Moon, the Sun and a Magic Square. The first two are fairly easy to accomplish, but the magic square is a tad bit harder. 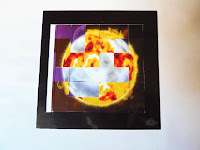 This one is similar to the above puzzle. 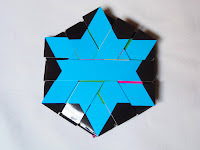 You have an hexagon with 18 strips and the object is to weave them into one of the possible four stars. 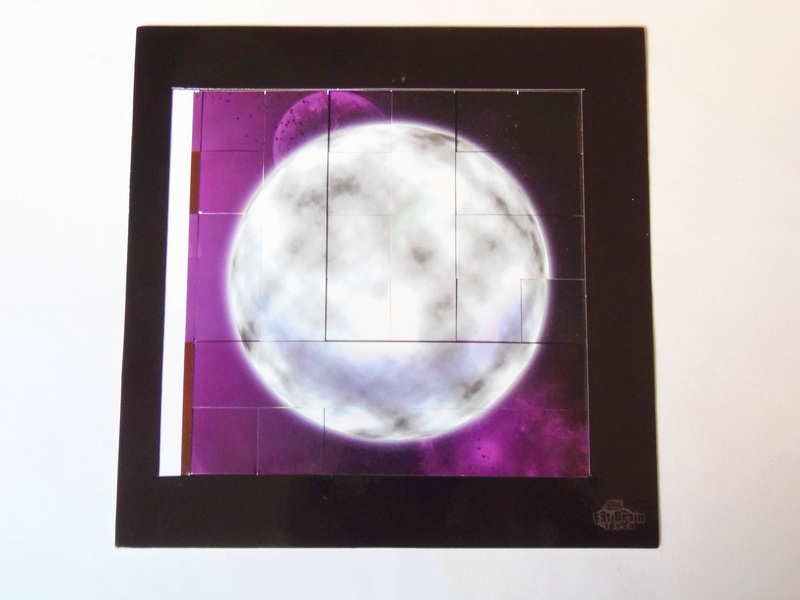 Note: I found it rather difficult to photograph the puzzle after folding it to the desired shape, because it just wouldn't stay in place. A bit of adhesive tape solved the problem. 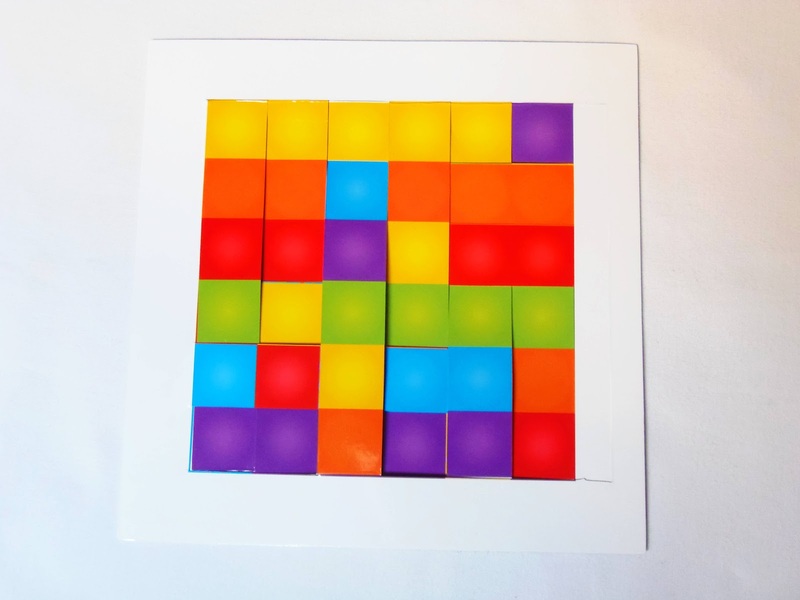 In this puzzle, you have three squares with four different colors. 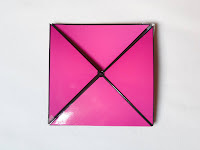 The goal is to fold it into a square as to show a solid color on both sides. This one was also a bit tricky to solve. I had to resort to the adhesive tape as well to hold it in place for the photo. 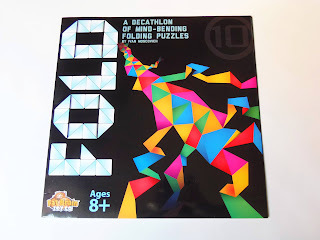 Fold has a variety of difficulty levels and the challenges themselves are also very original, which will sure captivate any curious mind. I like that all the puzzles have a wide color palette, offering a fest to the eyes. There's something here for everyone. Availability: You can find the Fold puzzle collection at Fat Brain Toys for just $13 USD. 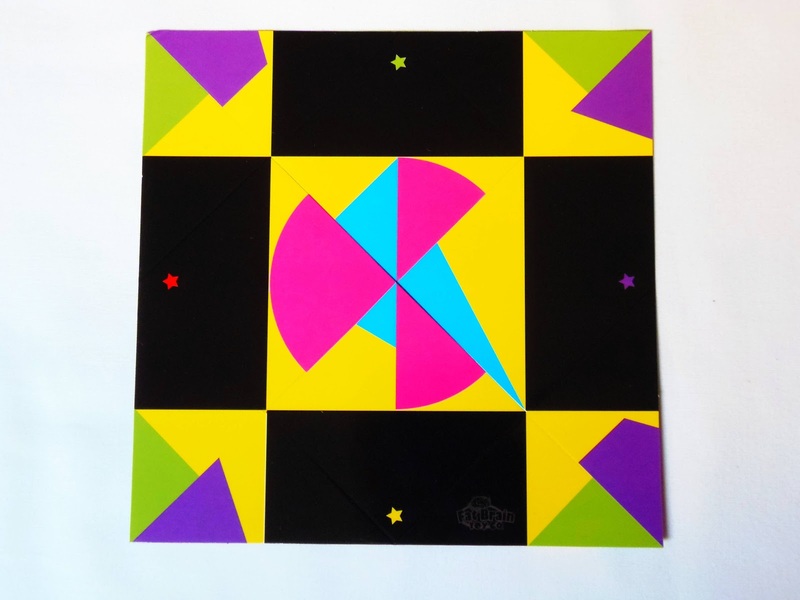 In my latest PuzzleMaster shipment, half of the puzzles included were from Jean Claude Constantin - A real treat. As a result, you're going to see plenty more reviews for his puzzles. Today's puzzle is the 8 Balken (German for bar), and as the name suggests it's comprised by eight bars that have small discs attached to them. Each bar can have one, two or up to three discs attached. 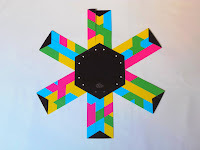 A small detail you should notice once you have disassembled the puzzle is that there are four different colored bars, and for each pair of bars the combined number of discs is four. This is not done by accident and it's something to keep in mind once you're trying to solve it. The colors aren't just for aesthetics either, as the solution follows a simple rule of colors. The first thing it came to my mind when I first saw the puzzle was the 4-in-line game. I bet Constantin was inspired by it to create this puzzle. 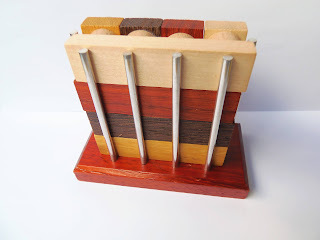 The rest of the design is complemented by a beautiful red-colored wooden stand, and the pieces are kept in place surrounded by ten metal rods, which contrast nicely with the wooden pieces and stand. The 8 Balken puzzle is a bit tricky to solve, not just for its level 8/10 difficulty, but also because it's kind of a pain to assemble. 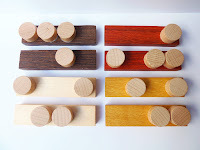 Now, one of things you have to make sure when assembling the pieces back to their original positions is that no two colors can be repeated on any row or column. The final rearrangement has four pieces in the vertical position and the remaining four in the horizontal position. The annoying part is that when you think you're close to packing all the pieces, the layout of the remaining ones don't match the already packed. And the worst part is that you don't know if you need to exchange just one pair of bars or more. 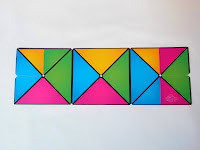 My strategy to solve the puzzle was to pack a pair of the same colored pieces, one in the vertical and the other in the horizontal, as if you were following a sequence. This way it's easier to remove the pieces if you need to make some changes. 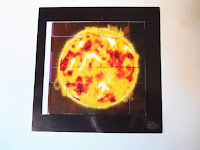 Solution: If you need a solution for this puzzle, you can download it here. Availability: PuzzleMaster has the largest selection of Constantin's puzzles that I know of. You can find the 8 Balken and over 150 more there. Continuing on a more romantic tone with these past couple weeks, first with the Cast Ring followed by the Cast Ring II, today I present to you the Cast Heart, another gift from Hanayama to all the lovers out there. This puzzle was released over 11 years ago, in May 2001. As for its designer, I haven't found any information about him. If you know who he is, please let me know. 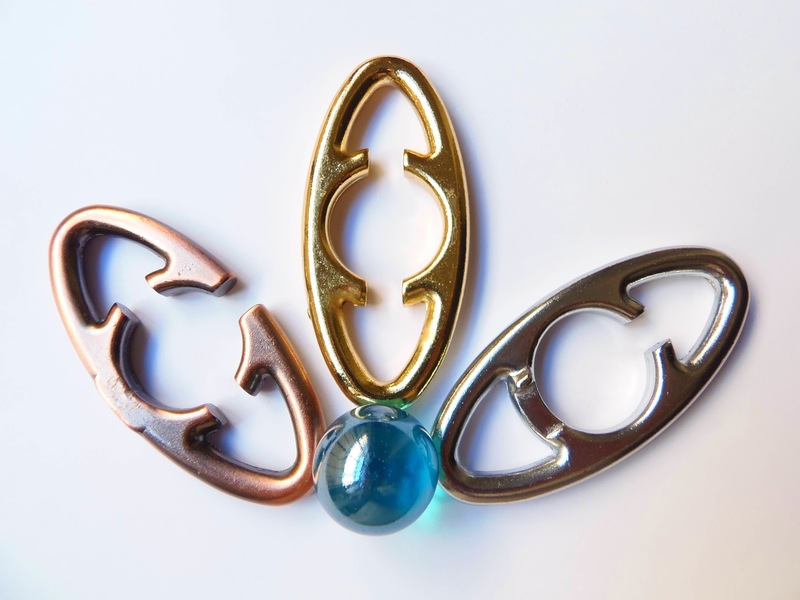 Like many Hanayama Cast Puzzles, the first thing you notice is its striking beauty. 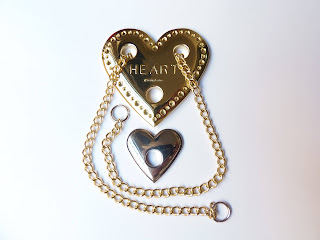 The puzzle is comprised by three main parts: a large golden heart; a smaller silver heart that perfectly fits in the middle of the bigger one; and a golden chain wrapping both hearts together. Also worth mentioning is the outline of small grooves around the large heart, which could be used for a more personalized design with encrusted jewels. The object of the puzzle is to separate both hearts and try to unite them again, all using the chain and its fiendish knots. Since I've begun collecting puzzles, I've always dreaded those that use ropes and strings, mostly because it's easy to make a mess out of them. You can now imagine how I felt when I tried to solve the Heart. Fear aside, the puzzle is classified by Hanayama as a level 4/6, so while being a little challenging, it shouldn't be too much trouble, right? - Wrong. That chain was destined to make me go through some very frustrating moments. From the pictures it's not so clear, but the chain's rings at both ends can't pass through the hearts' holes, so you have to work out how to undo the knots that keep the hearts together. Suffice it to say, there was more knots in the puzzle than the original ones in no time. I knew that was going to happen, so now I had to undo the ones I did plus the ones that I was trying to undo in the first place. Double trouble, and I was just starting... A shameful amount of time later, just to return the puzzle to its original form, I found a way to lengthen one of the chain's ends by passing a portion of the chain through one of the large heart's holes. As the knot is equal on both sides I did the same thing on the other hole, and voilá, the small heart was finally free. Now, returning the puzzle to its original state should be a piece of cake, right? - Wrong again. 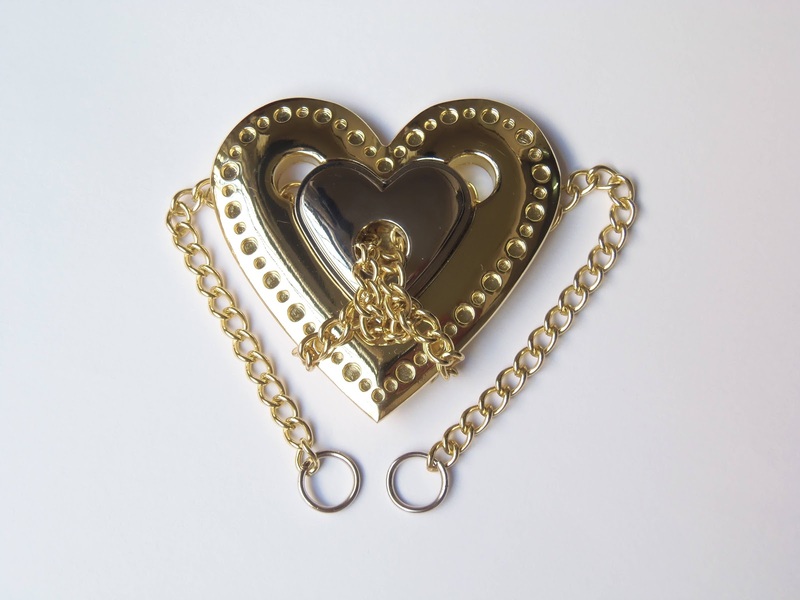 Although I know how to remove the small heart from the chain, I couldn't bring myself to do it in reverse just yet. So, as of now, the puzzle is still halfway through to its formal glory. I just have to find the patience to do it. I found the Cast Heart to be a little similar to the Ring puzzles previously reviewed, in which they have quite a beautiful design, but very frustrating solving methods. A true test to your patience and not recommended for novices. Availability: You can get a copy of the Cast Heart at Sloyd.fi in Finland. You can also find there all of the others in the Hanayama Cast Series. 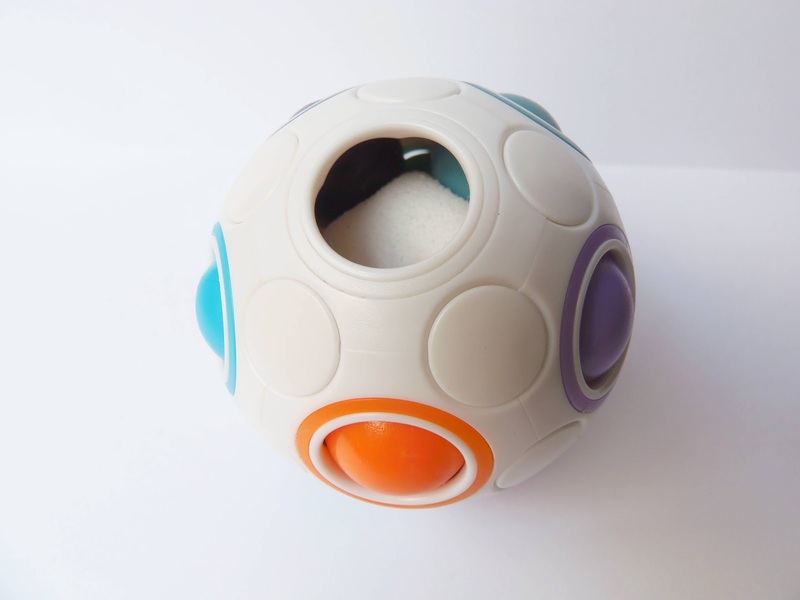 Orbo by Popular Playthings is a very original puzzle concept where you match 11 colored spheres to their respective outlined holes. It's a simple idea, but very fun to play with. Out of the 12 holes, 11 are colored and one is left empty. This is to make sure that you have room to move the spheres around. The object is to move any given marble to a neighboring empty hole, and so on and so forth until the puzzle is completely scrambled. The next step is to have all the spheres return to their corresponding outlined hole. One of the things that impressed me the most when I first picked it up was its size. By the pictures, I was expecting something much bigger, at least twice the size, but it's in fact about 7cm in diameter (2.8"), which is slightly bigger than a standard Rubik's Cube. Speaking of which, some describe the Orbo as the round version of popular Cube. Well, in my opinion, I think it's kind of an overstatement, because the two puzzles couldn't be any more different. Even the concept and mechanism is totally different. Enough of comparisons... The Orbo deserves its own identity, because there's nothing quite like it. The mechanism is simple, but effective: in the center there's some kind of foam that makes the plastic marbles snap into place. I don't know how this material will behave as you continuously play with it, but it's possible that'll lose its strength with time. 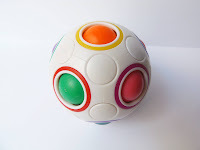 Also, expect to have sore fingertips after playing with it for a while, because there's a bit of pressure required to move each sphere into place. I was expecting the puzzle to be a little more challenging, but after solving it within 5 minutes I realized that the method is just simple logic. There's no need for fancy algorithms or pre-learned movements, as intuition and trial and error will do just fine. Still, a very fun puzzle to have around and solve again from time to time. 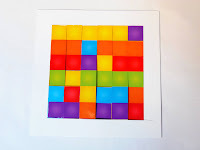 Video: To have a better idea of how the puzzle works take a look at this video. 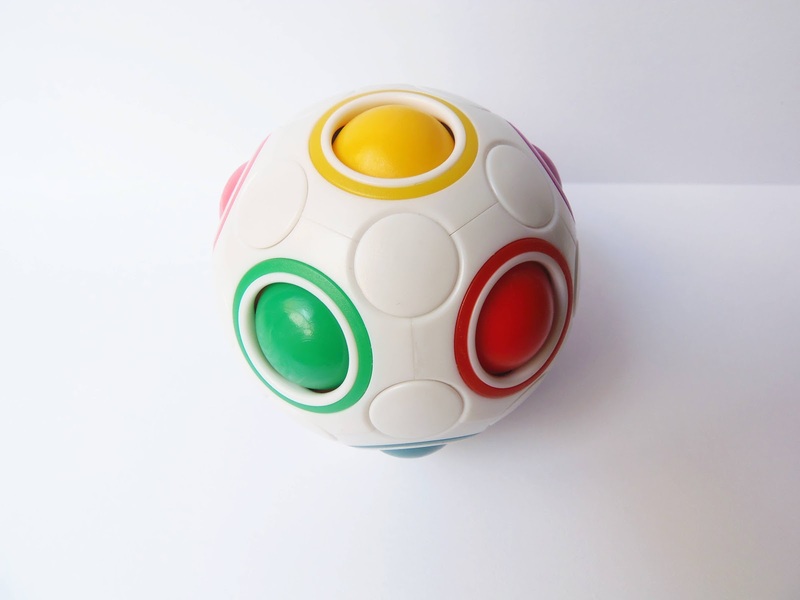 This small multi-colored ball stands out among many puzzles out there. Some may mistaken it for some child's toy at first, but the Orbo will sure get you hooked no matter what your age is. The low level of difficulty is also a key to please a wider market. 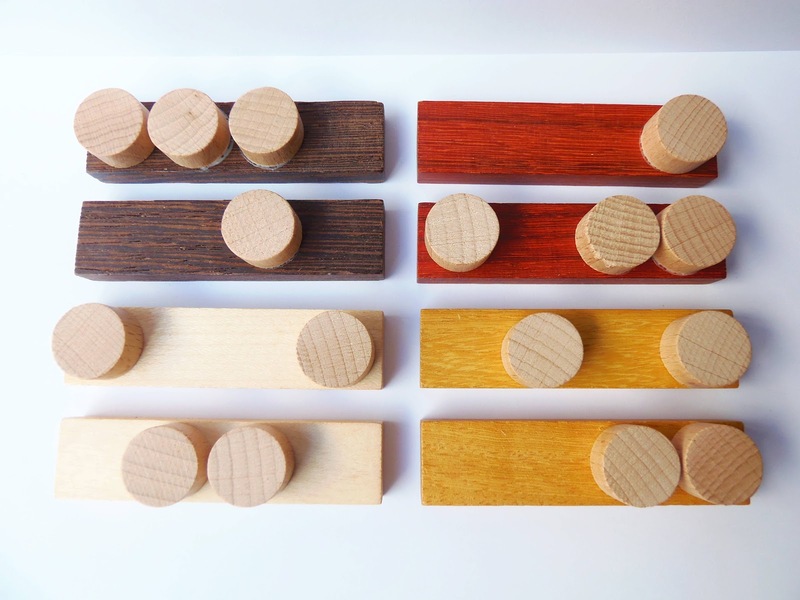 Availability: You can get your Orbo at Brilliant Puzzles for just $10 USD. 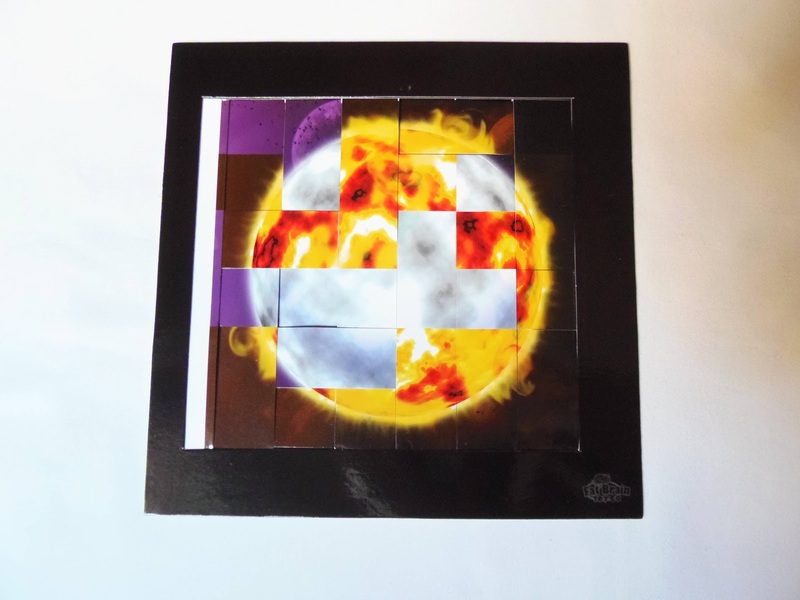 EZ Atom by Doug Engel is a stunning looking puzzle, produced by PuzzleMaster in Canada. 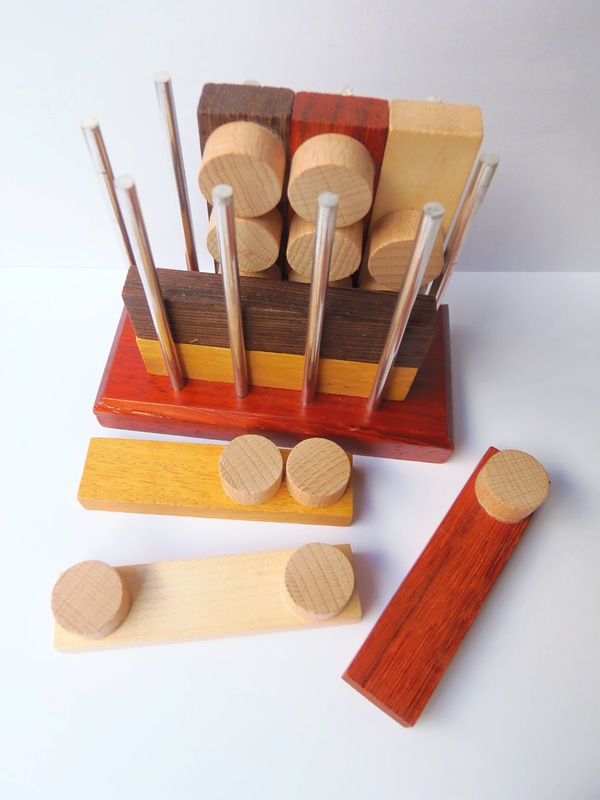 Doug is known for his elegant and exquisite puzzle designs, mostly in metal, as you can see here. I have a few of those in my collection. 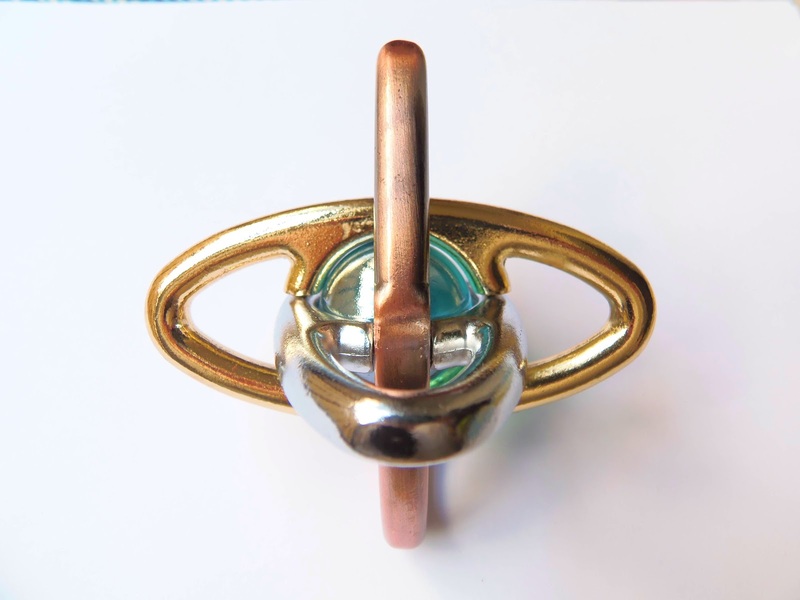 The EZ Atom is comprised by three metal pieces coated in bronze, silver and gold, plus a blue marble, which is trapped in the middle. Looking like an impossible task at first, the object is to take all the pieces apart and free the marble. The design principle reminds of Constantin's Sputnik Ball, also reviewed a couple of weeks ago (see this post), where you also have a trapped marble in the middle that looks impossible to get out. While in the Sputnik Ball there was a sort of trick to free the marble, the EZ Atom is not that "tricky" and the solution is as simple as using a bit of force... Actually, I want to emphasize the force part, because it does require a good amount of pressure to release the pieces just enough to disassemble it. This is a puzzle that is rated by PuzzleMaster as a difficulty level 6/10, but I have to disagree with this one. Should be more like a 7 or even an 8. Curiously enough its difficulty level is described as "tricky", although there's no trick involved. When you first try to take it apart, the puzzle pieces don't have that much room to move, so you're made to believe that it must have another way to be solved other than brute force. It took me about half an hour to figure out that applying pressure on the pieces was the only way. 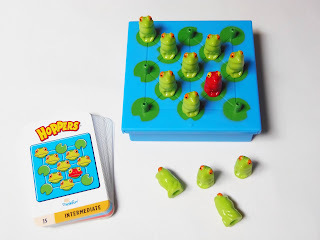 I'm not sure if my copy was tighter than usual or if this is standard for the design, but as I see it, not everyone will assume, at least not at first, that the puzzle does needs some force to be solved. This is why I think the puzzle is actually harder than it's advertised. Reassembly is also a bit challenging, especially if you didn't pay much attention to the order that the pieces were removed. You should be able to figure it out soon enough though, because the three pieces are all dissimilar and have different openings. Hint: the bronze piece is the first one out and last in. Solution: If you get stuck, you can download a solution guide here. Despite getting harder than I was expecting, the EZ Atom is a really nice puzzle. If you like a challenge, you're in for a treat. As well as being a great-looking puzzle, it also offers some frustrating moments. Can't ask for more, now can you? 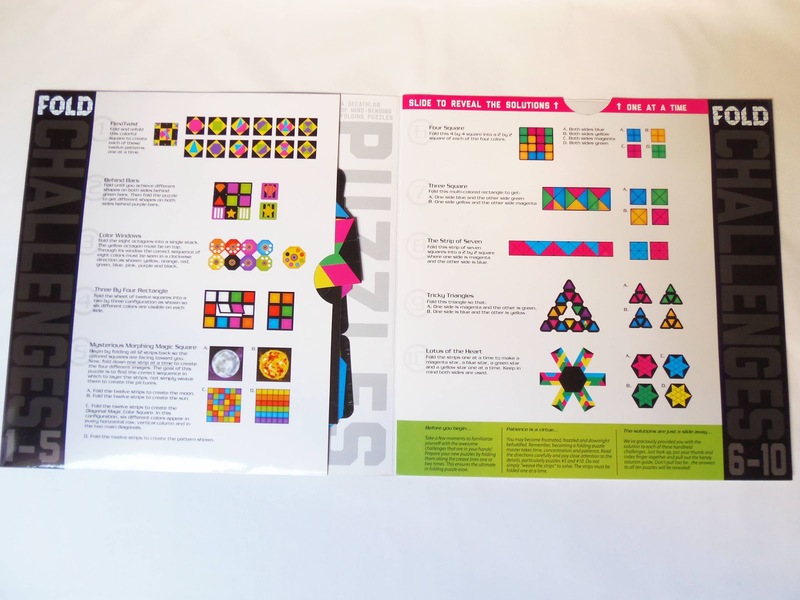 Availability: You can get a copy of the EZ Atom at PuzzleMaster for $16 CAD.